I was no stranger to feeding a gaggle of hungry kids growing up. My own parents did it. I never really got a good appreciation for it though until I was grown. Then it was my own kids. Constantly eating me out of house and home. Crying for snacks at all hours of the days and night. Oh, the snacks. Meanwhile I’m over here trying to keep it mildly healthy, but also delicious. All the while not breaking the family’s grocery budget for the week. Prepackaged snacks are great for so many reasons. I mean, hello! They’re almost always just flat out yummy. That doesn’t even factor in the convenience quotient. Plus you’ve got the efficiency bit, what with them being prepackaged into handy little serving sizes. Except- they don’t take the actual kids into consideration. All of this lead to me throwing in the towel, and deciding that it was just easier for me to make some of my own snacks the kids could have. Snacks we allllll liked, without any pesky bits to be picked out & tossed aside. 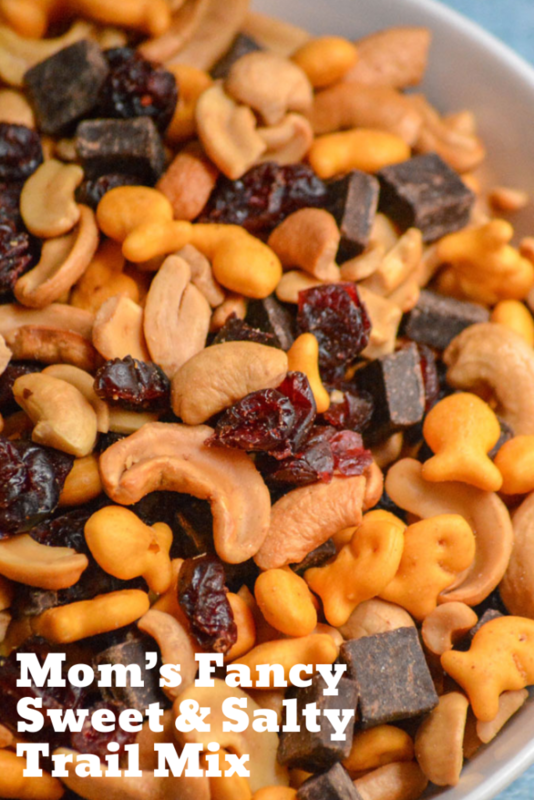 That’s how we ended up with this tasty little recipe for Mom’s Fancy Sweet & Salty Trail Mix. 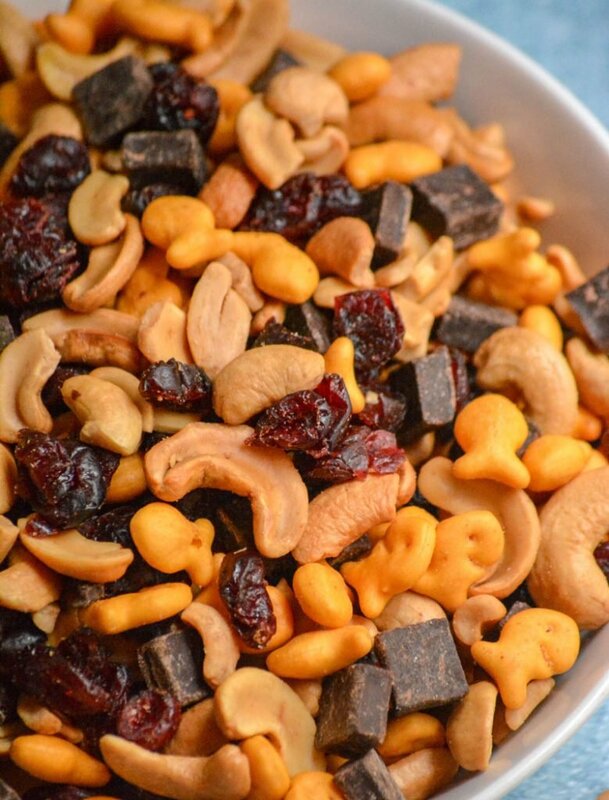 This trail mix recipe is surprisingly simple with only four ingredients, but it’s incredibly filling. Don’t be put off by the combination either- it’s the best blend of sweet & chewy with crunchy & salty textures. We can’t get enough, or seem to keep enough mixed up and in the pantry. Again this plucky recipe needs only four simple ingredients. Four. For me, that’s fantastic- and a real winner. 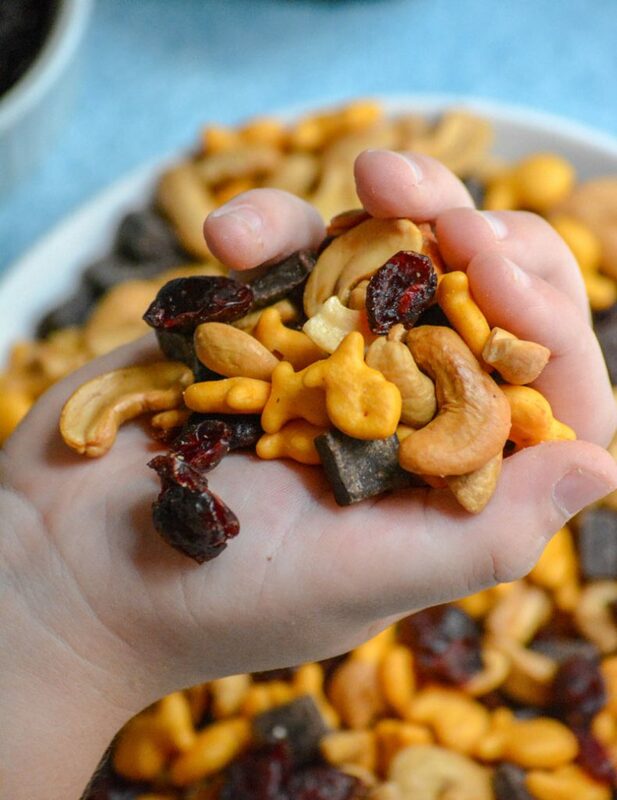 Dark chocolate chunks, dried cherries, baby sized goldfish cheddar crackers, and cashews- those are the simple ingredients we mix together to create our Mom’s Fancy Sweet & Salty Trail Mix. Snacks are all important in our house. For real. I don’t even thing there’s a way you can go wrong in that department either. It is what it is! 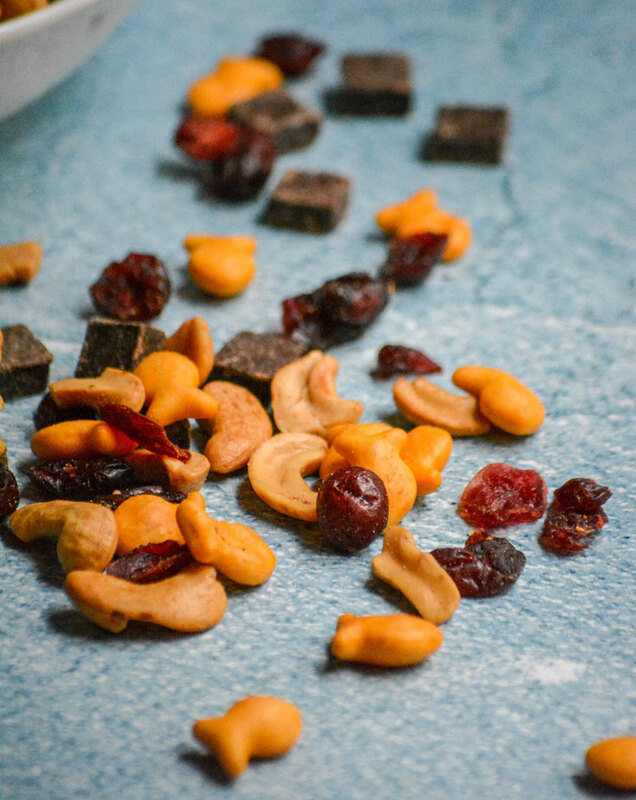 Mom’s Fancy Sweet & Salty Trail Mix is the best snack to hit modern day kitchens. 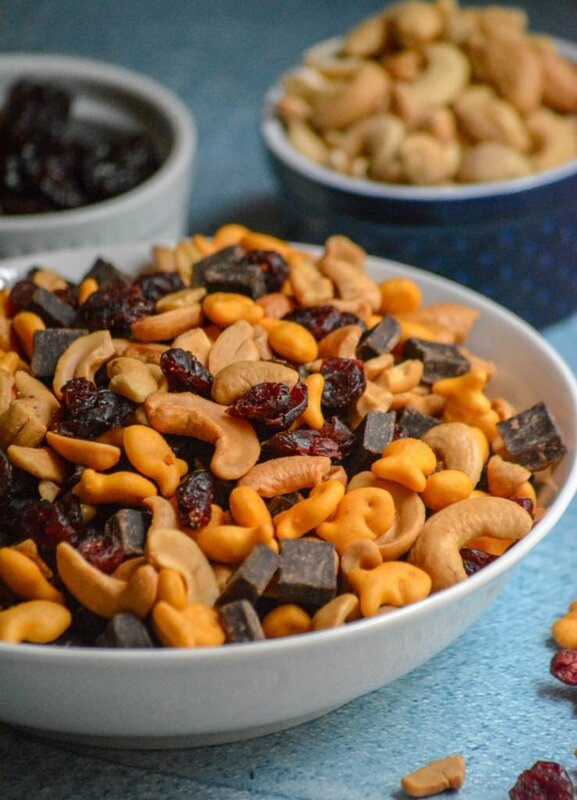 Sweet & salty, Mom's version of trail mix is a family favorite that can be made in minutes and borders on gourmet. Add everything to a large mixing bowl. Stir together until all ingredients are evenly combined. Serve immediately, or store in an air tight container- or ziplocking bag- for up to a month. 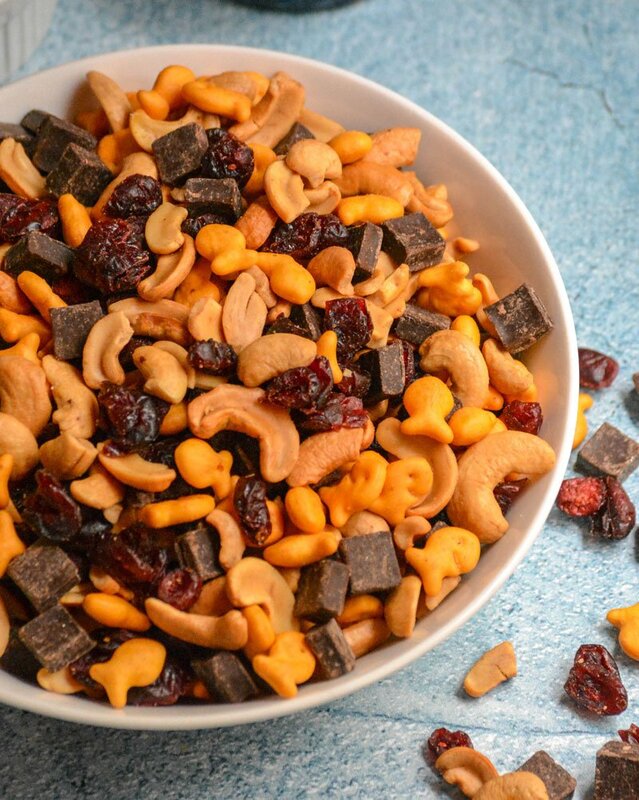 Snack mixes are so fun! I love this sweet and salty combination. 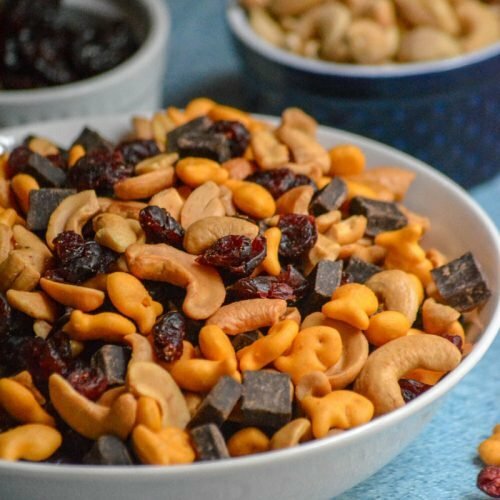 We, in India, make our own version of trail mix, with nuts and raisins and all sorts of fried stuff. I’d never have thought of using cherries and chocolate chips in it, though. I’m constantly amazed by how similar, yet how different all of us are – all over the world!